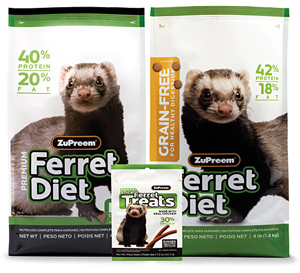 ZuPreem® Premium Ferret Diet is a nutritious and highly digestible diet designed to meet the total nutritional needs of growing, adult and reproducing ferrets. This diet is formulated with real chicken and egg, and delivers the high level of protein ferrets require. Fortified with vitamins and minerals, and the amino acids taurine and methionine, ZuPreem Premium Ferret Diet requires no supplements. Premium Ferret Diet is nutrient-dense and contains 40% high-quality protein and 20% fat to fuel a ferret’s high-energy needs. No corn or fishmeal. Naturally preserved. ZuPreem® Grain-Free Ferret Diet helps support healthy digestion. Ferrets are meat lovers by nature and are simply not made to digest foods such as corn, rice and soybeans. With 42% protein this diet includes high-quality meats for a great taste ferrets love.